Digital electronic controls make setting your grill as easy as setting your oven, all it takes is the turn of a dial. 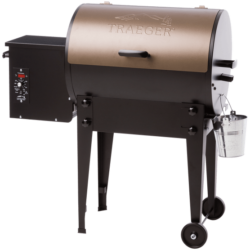 Traeger grills use Advanced Grilling Logic® to ensure that you get consistent temperatures throughout your cook, and some models even offer Smoke Science technology. This increases smoke production within the grill when you use the Super Smoke mode function, and ensures your grill only uses the highest quality smoke, thin blue smoke, for optimal flavor.